Candidates for governor, from left, Republicans Sen. Patrick Colbeck, Saginaw obstetrician Jim Hines; Democratic front-runner Gretchen Whitmer, Atty. Gen. Bill Schuette, R., Democrits Shri Thandehar and Abdul El-Sayed, GOP Lt. Gov. Brian Callley. Most polls apparently assume Gretchen Whitmer, the former state senator from East Lansing, will be the Democratic candidate for governor in the November election. The latest Real Clear Politics (RCP) poll shows Whitmer ahead of GOP candidate Bill Schuette, the state attorney general, 42-37. RCP rates the race a "toss-up." An upset-minded Shri Thandehar, Ann Arbor entrepreneur, a Democrat, is rising fast in name recognition and support as the August 7 primary nears. A Marketing Research Group (MRG) poll shows Thandehar with a 3 point lead over Whitmer, 21-18. "Thandehar bills himself as an insurgent candidate who's running a more progressive campaign with proposals like legalizing pot and using the money to fix the roads, implementing a $15 per hour minimum wage, implementing universal health care, eliminating tax subsidies for the rich, and banning for-profit charter schools," comments the Metro Times. A big difference is that while Whitmer is raising scads of money from unions and corporations like Blue Cross, Thandehar is refusing corporate cash for his campaign. So, if the upset occurs, Whitmer will be replaced by Thandehar in the runoff, foiling all the pundits and political observers. A shocker would be a win by Thandehar over a Republican in the fall. Who knows, it might not even be Schuette in the final as Lt. Gov. Brian Calley is scrapping his way into the race, giving Schuette a run for his money. The latest RCP poll shows Schuette crashing 31 points from a high mark last September, according to Mitchell Resarch, and Calley rising, narrowing Schuette's margin to 8. Schuette is a strong public backer of embattled President Donald Trump. Meanwhile, the three Democratic candidates, Whitmer, Thandehar an upstart 33-year-old Detroit healthcare official Abdul El-Sayed, M.D., have been sparring. El-Sayed has increasingly singled out Blue Cross in his campaign, seeking to tie the Detroit-based insurer to the race's front-runner, former Sen. Gretchen Whitmer, whose father, Richard, was president and CEO of BCBSM from 1988 to 2006. In an interview with Crain's (Detroit business magazine), Whitmer said establishing a Medicare-for-all health insurance system in Michigan is "not realistic." "I don't oppose that, but it's not a real option right now," Whitmer said of single-payer health care. "... The projections tell us it's not realistic in Michigan at this moment." The winner of the Democratic primary will face one of four Republicans in the November election: Attorney General Bill Schuette, Lt. Gov. Brian Calley, state Sen. Patrick Colbeck or Jim Hines, M.D. 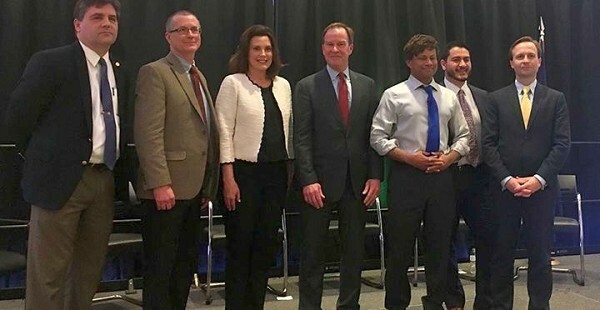 The Democrats answered questions about business taxes, tax increases, tariffs, marijuana legalization, road conditions and other topics during the hour-long debate hosted by WDIV-TV in Detroit and the Michigan Democratic Party. Thanedar, who has owned chemical-testing companies and has given his campaign nearly $6 million, said he is the only gubernatorial candidate who has created jobs and contended that he is best-positioned as a contrast to GOP front-runner Bill Schuette. "I will make Michigan inclusive and progressive," he said.